Prevailing Wind Power walks you through every step of the process. The following steps should give you a good idea of how we work. Site Walk - CALL 310-529-5217 to schedule a site visit. PWP will ask a few questions by phone to see if you are a good candidate for wind and/or solar. For example, what size is your lot? Unobstructed area? Good wind? Good sun exposure? We will call your local planning department to determine if zoning allows for a wind turbine and/or solar panels. We will look at a site map online, to get familiar with the terrain. 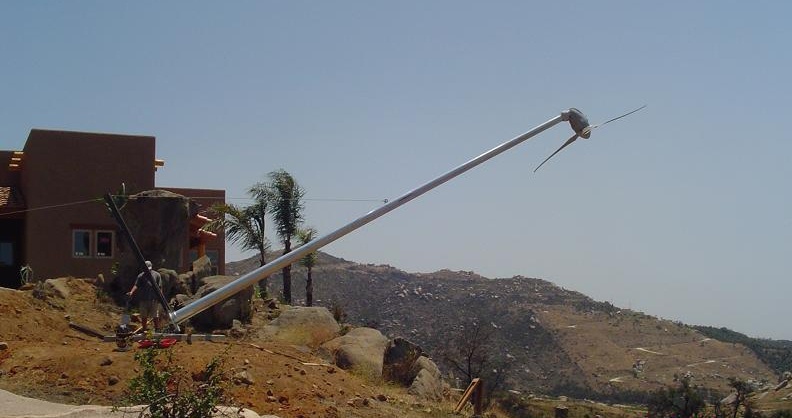 PWP will then visit your site to check average wind speed or sun exposure, ideal location for turbine or solar, and note location of utility meters for grid connection. We will provide a written estimate of cost for you to buy the system, including permitting and professional installation. A purchase agreement will be provided for your review. Once you decide to go forward, a signed agreement and deposit will be requested. Our engineers will make site map drawing of the equipment installation to obtain building permits. PWP visits local or county permit authority for your area to obtain permits. We work with your utility to arrange for a net-metering agreement. Once we have a permit, we can begin the installation. If using wind power, we will arrange for a licensed contractor to dig the hole for the turbine foundation, and for a licensed cement contractor to pour the foundation. After the foundation has cured, a licensed contractor will install the tower and turbine and connect the system to the grid or battery storage, as designed. After final inspection, the turbine is ready to go!